Finbitex Review 2018 | Is Finbitex a Scam or Legit Forex Broker? Beware Finbitex is a Non-Regulated broker. It is NOT SAFE to trade. 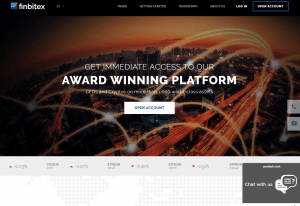 Finbitex is a forex, CFDs and cryptocurrency broker. The company is owned and operated by Tempolex LTD., based in the Marshall Islands. It is one of the popular offshore zones for the brokers, however, such companies come with a certain level of risk for the traders as many of them turn out to be scams. They promise huge profits and attract traders ensuring that with offshore-registered firms one can avoid or lower his taxes. However, usually most of these companies are not overseen by any authority and if something goes wrong, investors won’t be able to get their money back. In addition, the terms and conditions on the website state that Finbitex is under jurisdiction of Bulgaria, although the broker is not regulated by the local Financial Supervision Commission (FSC). COnsidering all the mentioned above, we would not recommend choosing Finbitex as a broker. In order to control fraudulent activities, most countries have dedicated agencies to monitor the financial services sector. For example, there is a Financial Conduct Authority in the United Kingdom, Cyprus Securities and Exchange Commission and Australian Securities and Investments Commission. All of the brokers registered with them are obliged to follow a lot of rules and meet certain requirements. The brokers would have to be able to provide segregated accounts for the investors. Some of the regulators offer brokers to participate in the Compensation Schemes that guarantee the client will be able to withdraw his investments even if the broker goes bankrupt. Check the list of the FCA-regulated brokers here.